I grew up first on a dairy farm in upstate New York, then in a walnut orchard in Davis, California. I believe that those experiences informed my cooking and my interest in plants. I first put my passion for cooking into motion at the San Francisco Zen Center where I was a student for eighteen years. While there I held a host of kitchen positions, from head cook to guest cook at Tassajara, to private cook for the abbot and his guests. After eating my first meal at Chez Panisse in 1977 I immediately went to work there until opening Greens Restaurant in 1979. Greens was one of the earliest Bay Area restaurants to have a farm-driven menu as our nearby farm, Green Gulch, provided beautiful, organically grown vegetables to cook with. After leaving Greens I cooked for the director of the American Academy in Rome, then later opened Café Escalera in Santa Fe with Chez Panisse chef, David Tanis. I have had a variety of cooking, consulting and teaching jobs over the years. Known as a chef, cooking teacher I am also a writer whose specialties are seasonal vegetable recipes with an emphasis on farmers markets produce and heritage varieties. I am also a home gardener. Connecting people to the food they eat, its source and its history, has long been my work, and writing is one way to reveal the deeper culture of food. My interests lay with issues of biodiversity, seasonal and local eating, farmers markets, small and mid-scale farming, farmers and ranchers, gardens and gardeners. 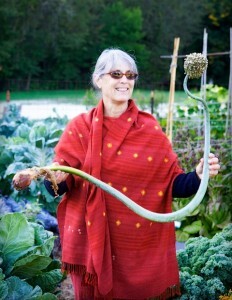 I have been involved with Slow Food in various capacities for more than a decade, served on the board of the Seed Savers Exchange, and was co-director of the Monte del Sol Edible Kitchen Garden in Santa Fe, New Mexico among other positions. For over twenty years I’ve lived in Northern New Mexico with my husband, painter Patrick McFarlin.